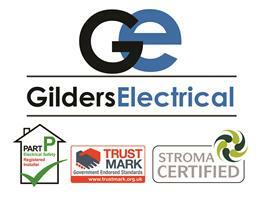 Gilders Electrical - Electrician based in Bradford, West Yorkshire. Gilders Electrical is a family run business with over 20 years experience in Electrics, spanning two generations of the Gilderdale family. We are proud of our English-Irish heritage, and are a STROMA approved contractor, providing a full range of electrical services to residential, commercial, industrial and public-sector clients. We have built up a reputation for the quality and reliability of our work across Yorkshire and beyond, and our professional services are now increasingly in demand on contracts throughout the UK. We have offices located in both Bradford and Leeds, allowing us to service a larger customer base more efficiently. Our work ethic and professional standards, delivered by our friendly, polite and considerate team, have enabled us to build a loyal customer base. Our pricing is highly competitive and we do not charge any premium for being further away from our places of work.